Thank Chairman Kline for that ‘red welt’ on your child. Kansas is one of 19 US states that still allows corporal punishment. Now, a Kansas lawmaker wants to give teachers and parents the ability to spank children a bit harder by defining spanking to allowing up to 10 strikes of the hand. And the bill would make it OK of those smacks leave redness or bruising. Corporal punishment is more common in the South, and in rural areas. In Texas, there were 49,197 corporal punishments in 2005-2006, according to federal education records. Thirty-one states have banned corporal punishment in public schools, according to the Center for Effective Discipline, an anti-corporal punishment group. The Center argues that spanking perpetuates a cycle of child abuse, and teaches children to respond with physical force when angry. It also notes that “schools are the only institutions in America in which striking another person is legally sanctioned. It is not allowed in prisons, in the military or in mental hospitals. Would Kansas be considering this legislation if Chairman John Kline would allow a vote on H. R. 1893 : Keeping All Students Safe Act. The legislation is designed to protect students from the abusive use of restraint and seclusion in school by establishing a minimum standard of protections in U.S. schools, similar to those already in place in medical and community-based facilities. The Keeping All Students Safe act does more than just set requirements for schools, it also, quite critically, provides school personnel with the necessary tools, training and support needed to implement positive approaches and ensuring the safety of students and school personnel. 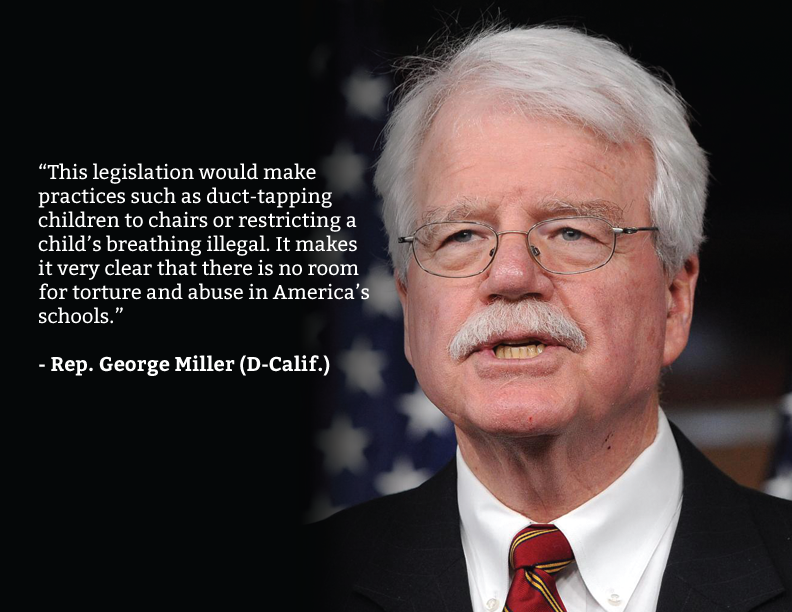 Representative George Miller (D-CA), along with Congresswoman Cathy McMorris-Rodgers (R-WA) first introduced a restraint and seclusion prevention bill in 2010, which passed the House with bipartisan support. The Senate counterpart to that bill failed to reach the floor for a vote. Congresswoman Cathy McMorris-Rodgers urged her colleagues to embrace the legislation. Mr. Speaker, I rise today in strong support of H.R. 4247, the Keeping All Children Safe Act, and I urge my colleagues to support it as well. When is it appropriate to lock up or tie up a child, or handcuff a child to a desk? Common sense tells us these extreme measures should not ever be used against children with autism or Down syndrome or other learning disabilities. Yet the truth is there are thousands of incidents reported involving the inappropriate use of seclusion and restraint. Reports by the National Disability Rights Network, GAO, and others reveal that our children are at risk for serious injury and even death in the school setting. The bill we are considering today outlines minimum standards that must be included in guidelines issued by the Department of Education. States then have the flexibility to determine how best to proceed. For the 10 States that already have comprehensive policies, all they need to do is show what they have already done. For the other States, the law will put in motion a review of current practices and a chance to put in place adequate guidelines. I would like to emphasize that these are guidelines. These are standards, like parents should be notified, that seclusion and restraints should only be used as a last resort, that training needs to be given to staff. I believe more often than not staff don’t even know how to respond. And I would also like to emphasize that there is no private cause of action. This bill is not opening up all these lawsuits. There are some that believe this is an unprecedented expansion of Federal authority, but I disagree. The Federal Government is involved in the schools. The Federal Government is the one that mandated that every child should have access to an education, including those with special needs. When we enacted the Individuals with Disabilities Education Act, we committed to ensuring that children with special needs have access to a free, appropriate public education. This bill ensures those children, as well as all students, are safe. One of the insidious results that will come from this bill is to take away from the States the right they have to regulate education. That is given to them by the Constitution. I believe the Federal Government has historically limited its reach into private schools, and it would be a mistake to start applying new Federal mandates to independent schools that do not receive taxpayer funding. I also believe that we do not protect schools by empowering trial lawyers. Since 2010, Chairman Kline has refused to allow a vote on this legislation … and now we have Kansas considering if they need to define how many slaps is enough … so that teachers can discipline without fear. Really, Chairman Kline … this is your Agenda … this is your legacy “red welts” on school children. Did the school have the right to discipline a boy in this manner? On Dec. 14, 9-year-old Christopher Baker’s mother, Sandra, heard him calling out to her as she walked to his classroom to pick him up after a troubled morning at school. She was shocked to look down and find his voice coming from a duffel bag on the floor, with its opening cinched shut. Baker’s teachers had allegedly elected to place him in what was described to the mother as a therapy bag after they said he smirked at his teacher and threw a ball across the room. Diagnosed with autism, Chris goes to school at Mercer County Intermediate School in Harrodsburg, Kentucky, where he attends classes designed for children with special needs. His morning went poorly and his mother was called to the school to pick up her son, which is when she discovered him in the bag. When Baker demanded her son be set free, the teacher’s aide struggled to release the drawstring. Chris was sweaty and upset when he emerged. In a meeting with the school a few days later, officials told his mother that this wasn’t the first time the boy had been placed in the bag in an attempt to control his autistic behavior and they made no guarantees that it would not happen again. Chairman Kline just ignores these problems. allowed to leave the seclusion room to use the restroom. The child subsequently urinated on the floor. Upon his return to school the following day, the school secluded him again for having relieved himself in the room on the previous day. 2011; reportedly, the child had been in seclusion for approximately four consecutive hours. arrival of the child ’s guardian. staff discovered that the child had attempted to hang himself. Since, school personnel do not actively observe children while they are in seclusion, no one knows for how long the child had been hanging prior to the discovery. Most teachers are very interested in success, and want kids to succeed. But I agree that Kline should be putting kids first.